Love and Lust, sounds familiar? 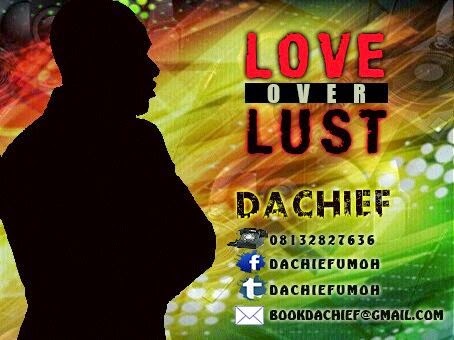 In this Season of Love, Dachief who is one of Nigeria's Leading Spoken Word Artiste gives a deep insight into Love and Lust and yes He paints the picture through his Spoken Word Piece - LOVE OVER LUST (LOL) from his CD - THE PLAN and has decided to share it with the world as his gift of love. Dachief is simply amazing, ‘Awesomeness’ embedded in Simplicity. A Spoken Word Artiste, Poet/Lyricist, the C.E.O - Plahnet Deagea, an Entertainment Manager, Event Manager and an Ideapreneur. After he made his official debut on the Spoken Word Scene in June 2013 via his annual spoken Word Event – Chapter One, he earned for himself the title – Nigeria’s Spoken Word Ambassador. And In Just 1 year he has through the media and events made the Art – Spoken Word Poetry gain a reasonable level of popularity around Nigeria. Watching his performances gets OH and WOW out of your mouth because he uses the people’s language to drop deep messages for the people. Dachief has got a CD – THE PLAN, it’s an Eight (8) track Spoken Word/Hip-Hop CD which features A-class Producer Mr. Dehniece, Soul & RnB singer – Goodness Paul, TY Wonder and a wowcious On Air/Online Personality – Marvel Umoh (Mr. Marv).